SA 1 Exams time table 2018, TS Schools SA I half yearly exams time table, #SA1,SA I, #Summative Exams 2018 Schedule, Summative Exams Time Table 2018, Primary Schools Summative Exams 2018 Schedule, UPS and High Schools Summative Exams 2018 Schedule, SA 1 Exams Schedule for PS, UPS and High Schools, SCERT, Telangana. As per he new academic calendar 2018-2019 the conduct of two Summative Assessments in an academic year along with other instructions pertaining to vacation, trainings, School Complex Meetings etc. Accordingly, the academic calendar was developed and provided to all schools along with dates for the conduct for Formative and Summative Assessments. Subject: SCERT, Telangane, Hyderabad - Summative Assessment (SA I) Reschedule of timings for class VIII scheduled on 08.10.2018- Orders. Refe: 1. This office Presse No.7002 /A/ CSTASERT/TS/2016, dt: 13.08.2018 ; 2. Representation from the President, PRTU, TS, ur No.132/PRTU/2018. - Answer scripts to children and declaring results 23-10-2018. In view of the subject cited above all the Mandal Educational Officers and Heads of all the Institutions of Government, KGBV, Model, Residential, Minority, Alded and Private Recognized Schools are hereby informed that Summative Assessment.l Examinations for the Classes 1-X will be held from 01.10.2018 to 08.10.2018 for the academic year 2018-19. Note: The Examination Duration for Second Language (Hindi/Telugu etc.) for the Classes IX and is for 03.00 hours in view of Single paper. During the Examination Period answer Scripts should be valued and cumulative Records shall be completed in all aspects by 27.10.2018. DSE Telangana: Rc.no.405 :: SCERT, Telangana, Hyderabad - Conduct of Summative Assessment Examinations(SA-1) From 01.10.2018 to 08.10.2018 - Orders Issued - Reg. All the RJDSEs, DEOs, Pas of SSA are hereby informed that, vide reference cited, orders have been issued communicating the time table to SA-I to be started From 01.10.2018 to 08.10.2018. Therefore, the revised schedule for conduct of the SA-I Examination i.e., From 01.10.2018 to 08.10.2018 is given below...During the examination period i.e. From 01.10.2018 to 08.10.2018 the answer scripts must be valued and Cumulative Records shall be completed in all aspects. The final results shall be declared and Cumulative Records must be issued to the children on 11-10-2018 without fail. A meeting shall be convened with parents & SMC members on 12.10.2018 in the school premises and Progress Cards (Cumulative Records) shall be issued to the children. The children obtain signature on Cumulative Records and return back Cumulative Records to the concerned teachers/ HMs on 13.10.2018. The teachers must collect the Cumulative Records/ Progress Cards from the students. All the DEOs are directed to take necessary action on the above and conduct exams seriously and confidentiality shall be maintained and see that the conduct of examinations and declare the results, convene parent meeting and issue of cumulative records to all the children must be taken up as per the schedule as above. The RJDSEs must supervise the Districts and observe the effective conduct of SAl Exams, paper valuation, issue of cumulative records, parents meeting etc.and submit a report to the Director of School Education. SCERT Telangana - Rc.No:7002 :: Subject: SCERT, Telangana, Hyderabad - Conduct of examinations (SA-I) from 01.10.2018 to 08.10.2018 and correction of answer scripts, completion of Cumulative Records, conduct of parents meeting in all Government, Government Aided and Private Schools - Order issued - Reg. తెలంగాణలోని అన్నిరకాల యాజమాన్యాల పాఠశాలల్లో సమ్మేటివ్-1 పరీక్షల నిర్వహణకు విద్యాశాఖ షెడ్యూలు జారీ చేసింది. *అక్టోబర్ 1నుంచి 8వరకు* నిర్వహించనున్న ఈ పరీక్షలకు అవసరమైన అన్ని ఏర్పాట్లను చేయాలని జిల్లా విద్యాశాఖాధికారులను ఆదేశించింది. ఈ మేరకు రాష్ట్ర విద్యా పరిశోధన శిక్షణ మండలి (ఎస్సీఈఆర్‌టీ) డెరైక్టర్ డీఈవోలకు ఆదేశాలు జారీ చేశారు. 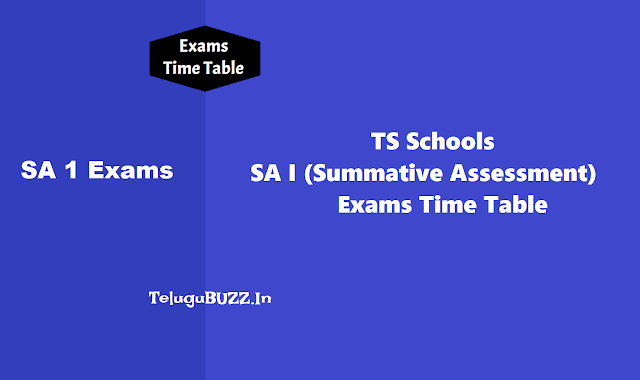 Note: The examination duration for Second Language (Hindi/ Telugu etc.) Paper for classes IX and X is for 03.00 hours in view of single paper. During the examination period i.e. from 01.10.2018 to 08.10.2018, the answer scripts must be valued and Cumulative Records shall be completed in all aspects by 27.10.2018. Therefore, the DEOs are informed to give necessary instructions to all the schools in the jurisdiction on conduct of Summative Assessment (SA), valuation of answer scripts and issue of Cumulative Records which shall be completed in all aspects by 27.10.2018. The DEOs are also informed to instruct the DCEB Secretaries to prepare and finalize including moderation of the question papers at their level duly conducting the workshops by involving expert teachers of concerned district and complete the whole process by 30.08.2018 and bestow their personal attention for improving the quality of the Question Papers of classes I to X by the DCEBs without any conceptual and language errors duly maintaining the secrecy and confidentiality of the Question Papers. Therefore, all the DEOs are instructed to take necessary action on the above aspects and conduct exams seriously and confidentiality complying with the earlier guidelines issued by this office Proc.Rc.No. 7002/ A/C&T/SCERT /TS/2016, Dt: 01.09.2018. Further, they are requested to adhere to the above schedule and instruct the Headmasters and Teachers that after the summative test, the teachers shall identify the learning deficiencies in terms of attainment of learning outcomes communicated by SCERT by analyzing the students answer sheets. Serious effort shall be made to undertake remedial teaching/corrective measures to ensure the attainment of learning outcomes by the individual. The learning strategies like tutoring, individualized learning could be adopted. The RJDSEs and DEOs are requested to visit the field and monitor the activities both exam and post exam activities. They are also requested to send Compliance Report on the above to the undersigned and as well as submit compliance for the Proceedings of the Director, SCERT, Telangana, Hyderabad.